This is not a book about one thing. It's not a 250-page dissertation on leadership, teams or motivation. Instead, it's an agenda for building organizations that can flourish in a world of diminished hopes, relentless change and ferocious competition. This is not a book about doing better. It's not a manual for people who want to tinker at the margins. 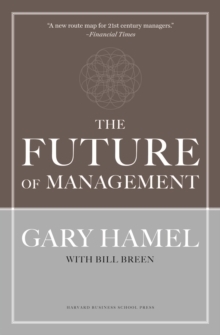 Instead, it's an impassioned plea to reinvent management as we know it to rethink the fundamental assumptions we have about capitalism, organizational life, and the meaning of work. 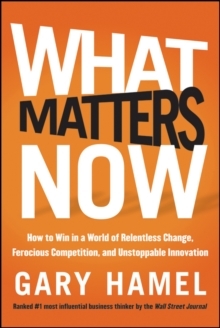 Leaders today confront a world where the unprecedented is the norm. Wherever one looks, one sees the exceptional and the extraordinary: * Business newspapers decrying the state of capitalism. * Once-innovative companies struggling to save off senescence. * Next gen employees shunning blue chips for social start-ups. * Corporate miscreants getting pilloried in the blogosphere. * Entry barriers tumbling in what were once oligopolistic strongholds. * Hundred year-old business models being rendered irrelevant overnight. * Newbie organizations crowdsourcing their most creative work. * National governments lurching towards bankruptcy. * Investors angrily confronting greedy CEOs and complacent boards. * Newly omnipotent customers eagerly wielding their power. * Social media dramatically transforming the way human beings connect, learn and collaborate. Obviously, there are lots of things that matter now. But in a world of fractured certainties and battered trust, some things matter more than others. While the challenges facing organizations are limitless; leadership bandwidth isn't. That's why you have to be clear about what really matters now. What are the fundamental, make-or-break issues that will determine whether your organization thrives or dives in the years ahead? 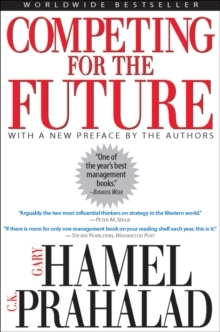 Hamel identifies five issues are that are paramount: values, innovation, adaptability, passion and ideology. In doing so he presents an essential agenda for leaders everywhere who are eager to...* move from defense to offense * reverse the tide of commoditization * defeat bureaucracy * astonish their customers * foster extraordinary contribution * capture the moral high ground * outrun change * build a company that's truly fit for the future Concise and to the point, the book will inspire you to rethink your business, your company and how you lead.